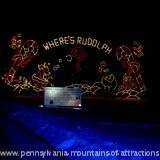 "Holiday Lights On The Lake"
Delight your family this holiday season at Lakemont Park's unique Holiday Festival "Holiday Lights On The Lake" in Altoona, PA. It will soon become your families dazzling holiday tradition. It's a unique Pennsylvania Holiday tradition! Visit Santa's Workshop. Join Santa in his sleigh, give him your Christmas list. 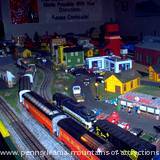 See a huge Model Train Display and beautiful ice sculptures. Munch on some delicious snacks, enjoy hot chocolate while your browse around the gift shop. Take a drive through a wonderland of bright Holiday Lights and incredible Animated Displays! Enjoy listening to Holiday music on your car radio as it is broadcasted live on Lakemont Park's Radio Network. You'll find it hard to believe this unique holiday PA Festival is inside a Pennsylvania Amusement Park. 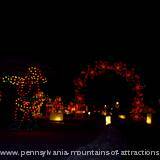 Lakemont Park's "Holiday Lights On The Lake" is celebrated every year in Altoona, PA, from November 22 to January 9, from 6 PM to 10 PM. Enter the contest! You can win some nice prizes! It's a new game called, "What did the Grinch steal?" By the way, admission price is only $10.00 a car. Relax And Take In The Magic! Imagine 51 acres filled with thousands and thousands of Holiday Lights, incredible Animations, Spectacular Holiday Light Displays. There is never a hurry. 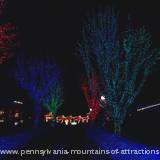 You'll enjoy slowly driving your car through Lakemont Park's "Holiday Lights On The Lake", follow along the paths as you drink in the magic. Stop and enjoy the Light Animations whenever you want. 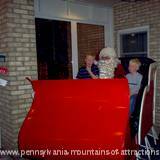 You will soon see how the people throughout the Allegheny Mountains have made a Holiday Tradition out of this spectacular PA Festival Holiday event each year. The pictures displayed here couldn't possibly do justice to the thousands of Light Displays. Especially the Animation and the magic you'll feel a part of. I'm only trying to provide a peek at what beautiful Holiday memories you can enjoy each year with your family. 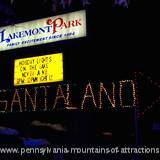 If you would really like to make a memorable Holiday at this PA Festival, try making reservations to reserve an old fashioned way of enjoying Lakemont Park's "Holiday Lights On The Lake". You can arrange to enjoy the magic while riding a Horse Drawn Sleigh, Wagon or Carriage. If you visit on the weekend you will enjoy live holiday music. You can call 814-949-Park for reservations! Or visit the link below! Over the past nine years, the patronage of visitors to Lakemont Park's "Holiday Lights On The Lake" has generated tens of thousands of dollars for Local, Regional and National Non-Profit Organizations. 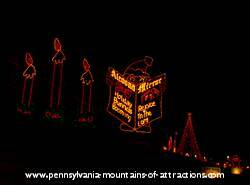 Additionally, Lakemont Park's "Holiday Lights On The Lake" made it possible to provide some much needed funds to the American Red Cross, Big Brothers/Big Sisters of Blair County, First Book of Blair County, Presbyterian Homes Foundation, and Quaint Corner Children's Museum. As you can see, your patronage at this PA Festival makes the Holidays brighter for many people from within our community. 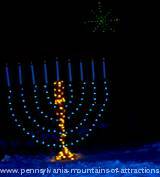 Once you complete your tour of "Holiday Lights On The Lake" your evening don't have to be over. Try visiting Santa's Workshop. There you will find a Gift Shop, two Snack Bars, with fresh caramel coated popcorn, hot dogs and hot chocolate. There is a Model Train Display that takes up a whole room. You'll see trains running in different directions in and out of tunnels and villages. There is always a Model Train Expert standing by to answer any questions and keep the trains running smoothly. Best of all, you can visit Santa. He sits in his sleigh waiting to talk and take pictures with all the children. You just can't help but leave with a smile on your face! 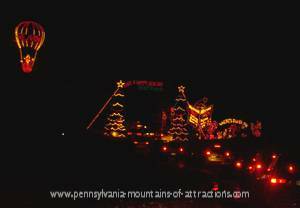 It's a holiday tradition at a PA Festival your family will want to experience every year. Each year "Holiday Lights on The Lake" gets bigger and bigger!